Starting this Friday evening through close of service on Sunday, there will be no train service to four Metro Expo Line stations — Expo/Bundy, 26th Street/Bergamot, 17th Street/Santa Monica College and Downtown Santa Monica — in order for crews to complete the one-year warranty repairs and upgrades. This will be the last weekend in February that work will be conducted on stretches of the Expo Line. While this weekend’s work is in effect, local and express bus shuttles will replace trains between Expo/Sepulveda and Downtown Santa Monica. This means all westbound trains stop at Expo/Sepulveda and turn back towards downtown Los Angeles. 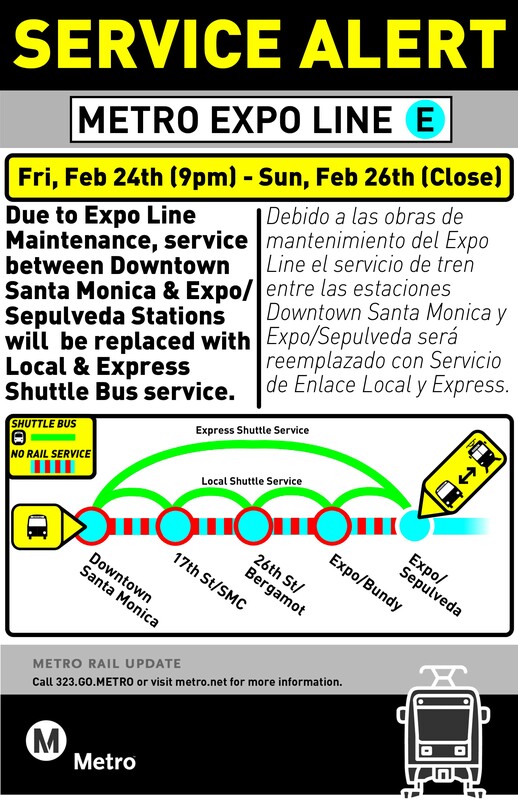 Metro shuttles will be available at Downtown Santa Monica for eastbound service. Eastbound train service will begin at Expo/Sepulveda. Expo Line trains are slated to arrive every 12 minutes during the day and every 20 minutes at night throughout the weekend. Bus shuttles will match Expo Line service levels as best as possible. However, trips are expected to take about 20 minutes longer than usual, so please allow extra time and plan accordingly. On Friday, Feb. 24, the last complete eastbound trips depart Santa Monica at approximately: 7:50 p.m., 7:04, 8:17, 8:30 and 8:43. The last complete westbound trips depart 7th/Metro at approximately: 7:37 p.m., 7:43, 7:49, 7:55 and 8:01. All times are subject to work related delays. Finally, thank you to our customers for their patience and understanding as we complete this weekend’s work. These repairs and upgrades will result in safer and more reliable Expo Line service. For more transit news and real-time service updates, follow us on Twitter at @metrolosangeles or @metrolaalerts.